If you ask me its predecessor, “Shooting at the sun”, is better – the same applies for most of their earlier works. If I had to pick just one, that would be “Behind closed doors” hands down. 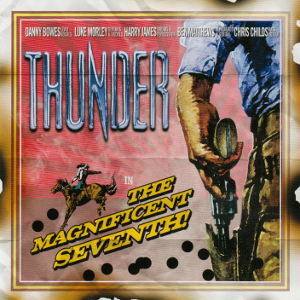 Nevertheless, there are a few songs here as well I’d include in my personal *best of Thunder* collection. The opening track “I love you more than Rock’n’Roll”, “Amy’s on the run”, the co-written by Russ Ballard “One fatal kiss” and last but not least the Japanese edition’s bonus “Love’s an easy word to say”. Nevertheless, “The magnificent seventh” is an album you can easily listen without calling it bad. “Behind closed doors” stay my reference even after all these years. Anyway, thank you very much for this one (I already have it, just needed the bonus track). FLAC all the way, mp3 is for those who don’t know what music is supposed to sound like. Sure, mp3 is good for portable players but then again so is a loud speaker outside. First of all, sorry if my English is not good enough. Thanks for the Thunder album, especially the FLAC rip. This is the kind of music (Hard Rock in lossless format) I like. Impressive!